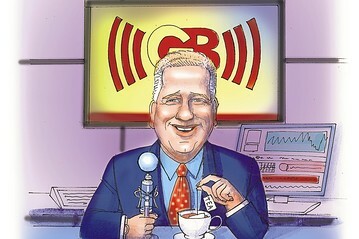 NEW YORK--Glenn Beck didn't always believe in what he was doing. "When I was young, I used to hear people say, 'He's a golden boy. Look at that guy. Can you imagine what he's going to be like when he grows up?' Well, I unfortunately bought into that. And I hadn't even found myself. Quite honestly, I was running from myself. But I knew how to work Top 40 radio." "Golden boy" was no exaggeration. "I was in Washington, D.C., on the morning show, by the time I was 18, programming a station by 19, No. 1 in the mornings. I think I was making, I don't know, a quarter of a million dollars by the time I was 25," he tells me in his midtown Manhattan office, a few blocks from the Fox News Channel studio where he now broadcasts his eponymous program every afternoon. A drinking problem helped plunge Mr. Beck into personal and professional crisis: "By the time I was 30," he says, "nobody would work with me. I was friendless, I was hopeless, I was suicidal, lost my family--I mean, it was bad. Bottomed out, didn't know what I was going to do. I actually thought I was going to be a chef--go to work in a kitchen someplace." Mr. Beck, 45, has many detractors, but there's no denying that he has made a success of himself. In addition to his Fox show, he hosts "The Glenn Beck Program," syndicated on radio, publishes a magazine and a Web site, and has written seven books. "Somebody told me that our footprint in a month"--the number of people he reaches in all media--"is about 30 million," he says. His politics are libertarian. "I really kind of dig this whole freedom thing," he says. "I'd like to pass it on to the kids." But he is pessimistic about the prospects for doing so: "I'm a dad, and I no longer see a way for my kids to even inherit the money that I'm making, let alone go out there, have an idea, and create it in their own lifetime." Mr. Beck blames a political system that he describes as corrupt and out of touch, a sentiment that is widely shared: "People in Washington . . . not all of them, but a lot of them, are not men and women of honor anymore," he says. "I just saw a poll today that said 25% of Americans now believe that their government officials will, for the most part, do the right thing. Only 25%. It's the lowest number ever recorded." Mr. Beck appeals to a slice of the remaining 75% with a style that is earnest and emotional; he is known to cry on air. Although he has reported on some major news stories, including the scandals involving Acorn and former Obama aide Van Jones, he thinks of himself as a commentator and entertainer rather than a journalist. "I'm not interested in breaking news," he tells me. "I'm interested in telling the story of what's going on and then trying to figure it out." In doing so, Mr. Beck draws strong negative reactions for both his right-of-center views and his populist style. "Right now, I'm getting hammered by the left and the right, and I get hammered for being an opportunist," he says. He pleads innocent, arguing that he was as hard on George W. Bush--especially over spending and immigration--as he is on Barack Obama: "Nobody seems to recall the years . . . when I was saying the same thing and program directors were calling me saying, . . . 'Are you kidding me? You're on a conservative talk radio network. You can't come out against George W. Bush.' Well, here it goes. "That's why I connect now with the American people, because the listeners that . . . have been with me for a long time know that I have said these things at my own peril, that I'm not in it for--I mean, don't get me wrong. I'm a capitalist. I dig money. But I'm not in it for the money." Cheerful and affable, Mr. Beck responds good-naturedly, even eagerly, when I ask him to respond to his critics. It's a far cry from the liberal stereotype of an angry hater. But his worldview has a dark side: "I don't believe our government officials will do the right thing. They will do the right thing for special interests and for some sort of agenda that they're not bringing me in on." When I ask him to respond to the charge that he is a conspiracy theorist, he answers, "I am the guy who debunked conspiracy theory." "I said those people were a gigantic danger from within, because we must trust each other," Mr. Beck says. "There are limits to debasement of this country, aren't there? I mean, it's one thing to believe that our politicians are capable of being Bernie Madoff. It's another to think that they are willing to kill 3,000 Americans. Once you cross that line, you're in a whole new territory." Yet while this is all to Mr. Beck's credit, it is not quite responsive to the question. It is possible, after all, to reject one conspiracy theory while espousing others, and the claim that "our politicians are capable of being Bernie Madoff" is, to say the least, a rather sweeping indictment. Mr. Beck's answer: "I believe the conspiracies, quote-unquote, that are happening now are happening all out in the open. All you have to do is track their actions. Their actions speak louder than their words. It's easy to throw out, 'Well, he's a conspiracy theorist.' Why do you say that? 'Well, because they say they're not doing that.' But their actions show that they are. "TARP, stimulus--a stimulus package that makes no sense whatsoever. No sense whatsoever! TARP, stimulus, health care that is behind closed doors, where they're giving Medicaid free to states, where they're saying, 'We're going to pay for it by reducing the cost of Medicare while we expand Medicare.' When you look at all those things, and you know that the people who are in and around the planning of those things believe in [welfare activists Richard] Cloward and [Frances Fox] Piven, believe in ['Rules for Radicals' author] Saul Alinksy--that's not a conspiracy. That's a pretty good educated guess." As an example, Mr. Beck notes that Sen. Tom Harkin, an Iowa Democrat, last month described the Senate health-care bill as a "starter home." Says Mr. Beck: "Sen. Harkin says to the progressive left, 'This is a starter home. Don't worry, we can add additions to this, and we'll grow it' "--a paraphrase of Mr. Harkin's remarks, but an accurate one. Mr. Beck continues: "Excuse me? That's everything that I've been saying you're going to do, and you've been denying it." This fall, Mr. Beck drew friendly fire on an American Enterprise Institute blog from Charles Murray, a social scientist with strong libertarian political leanings, who conceded that "Beck is spectacularly right (translation: I agree with him) on about 95 percent of the substantive issues he talks about." But Mr. Murray does not care for Mr. Beck's manner: "Our job is to engage in a debate on great issues and make converts to our point of view. The key word is converts--referring to people who didn't start out agreeing with us. We shouldn't be civil and reasonable just because we want to be nice guys. It is the only option we've got if we want to succeed instead of just posture. The Glenn Becks of the world posture, and make our work harder." Mr. Beck answers carefully: "I'm sorry he doesn't agree with me--doesn't agree with my approach." Then he notes the irony of a think-tank intellectual criticizing a populist media star for lacking broad appeal: "How many are reading his blog, and how many are listening to my radio show, television show, reading my books, going to conventions, seeing me on stage? I mean, I think, while I respect his position and his difference in opinion on presentation, I think one of us is probably reaching more people daily." He continues: "Look, I know a lot of people will disagree with the way I present things. I am being myself--I am a guy who is a recovering alcoholic, who lived a pretty fast life, who works hard every day, quite honestly, not to use the F-word--it used to be an art for me. I am a work in progress. But I also am a businessman that looks to get the word out to the maximum number of people." And he rejects the implication that his is a lowbrow appeal: "You name the conservative that can do a full hour--a full hour--on Woodrow Wilson and the roots of modern liberalism--for an hour--and have high ratings with it. . . . I had like three really big eggheads on the show, and people watched it. Now, you could be Charlie Rose all you want, but nobody's watching Charlie Rose." Mr. Beck identifies with the Howard Beale character from the 1976 film "Network." Beale, played by Peter Finch, is a news anchor on a fictional broadcast network who has a nervous breakdown on air, becomes a raving populist, and is a big hit with viewers. Mr. Beck invokes the fictional anchorman's most famous line: "I am mad as hell, and I'm not going to take it anymore. The part of Howard Beale that I liken myself to is the moment when he was in the raincoat, where he figures everything out, and he's like, 'Whoa, whoa, wait a minute! Why the hell aren't you up at the window shouting outside?' "
Mr. Beck adds, "What the media wants to make me is the Howard Beale at the end, the crazy showman that's doing anything for money. That I don't liken myself to." Some of Mr. Beck's detractors on the left, including MSNBC ranter Keith Olbermann, draw a more sinister cinematic analogy. Mr. Olbermann calls Mr. Beck "Lonesome Rhodes," the cynical TV demagogue played by Andy Griffith in 1957's "A Face in the Crowd." "I had never heard of Lonesome Rhodes," Mr. Beck says. "I had never seen the movie. . . . As soon as I heard that, I watched it. . . . Lonesome Rhodes and I, I guess, had a few things in common. He was a drunk. I'm in AA; he wasn't. He, at the very beginning, said things that he believed--I think. I'm not really even sure on that. I used to not say the things I believe. . . . Now I've made a vow to myself--it actually comes from Immanuel Kant, the philosopher: 'There are many things that I believe that I shall never say. But I shall never say the things that I do not believe.' . . . The minute I violate that, I'm back to the old drunk Glenn." The source of the comparison points to another difference between Mr. Beck and Lonesome Rhodes. Mr. Olbermann is no closer to the old ideal of the straightforward, objective newsman than is Mr. Beck, and cable television has yielded up a multitude of other personalities who blend news, strong opinion and entertainment in varying degrees, including Sean Hannity, Bill O'Reilly, Jon Stewart and, until his recent departure from CNN, Lou Dobbs. By contrast, the authors of "A Face in the Crowd" and "Network" imagined their protagonists as singular sensations who drew massive audiences at a time when viewing options were far fewer. At his peak, Lonesome Rhodes claims 65 million viewers, more than one-third of the entire U.S. population in 1957. Mr. Beck's Fox show, the third-highest-rated on the cable news channels, averaged 2.9 million viewers a day in 2009, according to Nielsen Media Research. Even his estimated monthly multimedia audience of 30 million amounts to less than 10% of all Americans. The development of cable television, with its diversity and audience segmentation, seems to have been a necessary condition for the emergence of such programming. Charles Murray may be right that Mr. Beck mostly preaches to the choir, but the observation applies equally to Mr. Beck's competitors and their respective choirs.